It was extra fun to be able to use the chock a block full sentiment set from Honey Bee and make a sentiment that suits the scene I created. Posted on May 31, 2018, in Card Samples, Challenge Entries, Debbie's Challenge Entries, Oscar's (Deb's) Card Samples and tagged Honey Bee Stamps. Bookmark the permalink. 9 Comments. This is SO cute, Deb. Love those sweet little bees. What cute bees and a very fun card too! This hop definitely does inspire me to look at my stamps a different way. I like the look on your poor worker bee’s face. 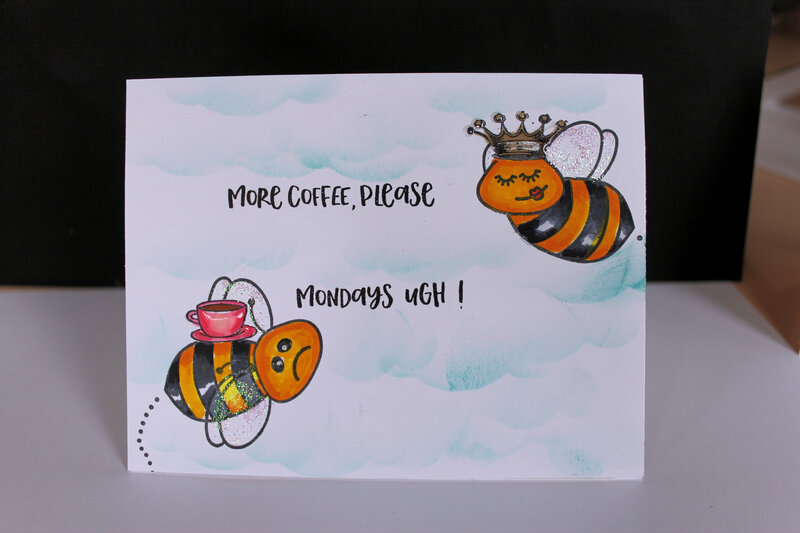 I agree MONDAYS…. LOL…I love your sense of humor. I love the pun sentiment here with cutest bees, great fun scene! How sweet! Love your cloudy background, those adorable bees and the fun sentiment! its so very sweet card.